TEL KEPE, NORTHERN IRAQ (ANS – Dec. 26, 2015) – On Christmas Eve (Dec. 24, 2015), Islamic State terrorists bombed ten Assyrian homes and a monastery in the Assyrian village of Tel Kepe in north Iraq. According to the Assyrian International News Agency (http://www.aina.org), the blasts injured several people. The monastery belonged to Assyrian nuns. According to residents, Islamic State threatened to bomb Assyrian homes in other villages in the area. 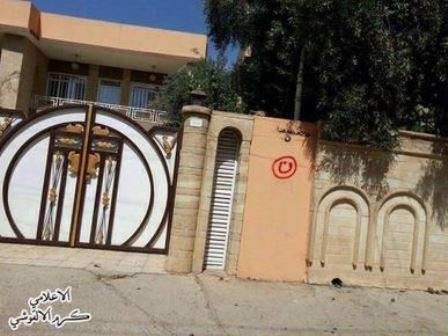 On November 27, 2015, a cemetery in Kirkuk used by the Assyrian Church of the East and the Syriac Orthodox church was vandalized. Graves were opened, tombstone and crosses were destroyed. Another Assyrian cemetery in west Kirkuk was also vandalized. The identity of the perpetrators is unknown. In August of 2015 IS drove into the Nineveh Plains in north Iraq, forcing nearly 200,000 Assyrians to flee from their homes and villages. Most have not returned. The Islamic State terror group captured the city of Mosul, Iraq on June 10, 2014. Almost immediately thereafter it began to drive Assyrians out of Mosul and destroy Christian and non-Sunni institutions. * There are no Assyrians/Christians remaining in Mosul, all have fled to the north, to Alqosh, Dohuk and other Assyrian villages. * All Christian institutions in Mosul (churches, monasteries and cemeteries), numbering 45, have been destroyed, occupied, converted to mosques, converted to IS headquarters or shuttered. * All non-Sunni Muslim groups in Mosul — Shabaks, Yazidis and Turkmen — have been targeted by ISIS. Most have fled. * Water and electricity to the Nineveh Plain have been cut off by IS. * Mosul is now governed under Sharia law. * 200,000 Assyrian have fled from Baghdede (Qaraqosh), Bartella, Karamles and dozens of Assyrian villages and towns in the Nineveh Plain north of Mosul. * 150,000 Yazidis have fled from Sinjar and Zumar. 40,000 trapped on Shingal mountain. Thousands have died from exposure. Thousands have been killed by IS. Note: The Assyrians are the only group in the world that still speak Aramaic, the language of Jesus. Photo captions: 1) Vandalized Assyrian cemetery in Kirkuk, Iraq. 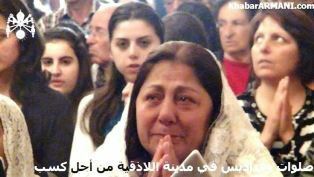 2) Assyrian Christian refugees in prayer. 3) Dan Wooding in Erbil, Northern Iraq, during a reporting trip for ANS. 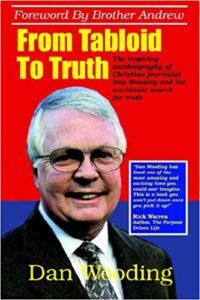 About the writer: Dan Wooding, 75, is an award-winning author, broadcaster and journalist who was born in Nigeria of British missionary parents, and is now living in Southern California with his wife Norma, to whom he has been married for 52 years. They have two sons, Andrew and Peter, and six grandchildren who all live in the UK. He is the author of some 45 books and has two TV programs and one radio show in Southern California, and has reported widely for ANS from all over the Middle East, including Northern Iraq.